“Dotard At The Dial” from the First Light LP by The Ratchets. 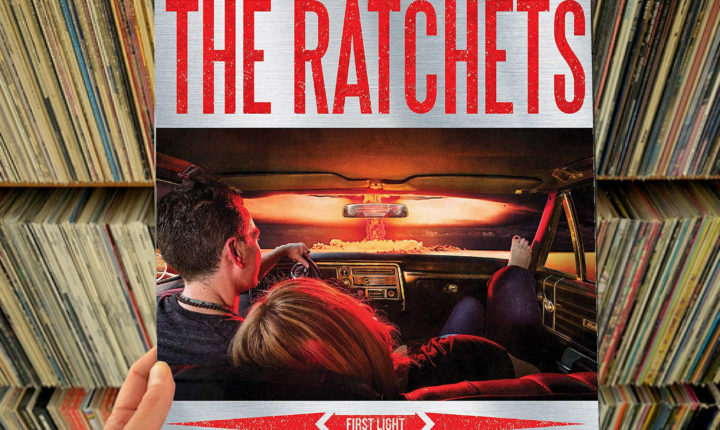 A deeper look at the grooves pressed into the First Light LP by The Ratchets. Anyone who has followed my contributions to this column likely already knows and understands that, while my coverage of vinyl records is very format-focused, I do not believe that the format itself deserves much discussion. Simply said, I do a lot of vinyl coverage because I like the SOUND of vinyl records – the color of the vinyl into which the music is pressed is irrelevant, unless different colors feature different sounds (which has happened, although it has seldom occurred intentionally), and so does not often merit mention, as a result. Even so, the Pirates Press Records pressing of The Ratchets’ First Light LP does deserve mention because, before one hears a note of music, the yellow, pink and orange vinyl conglomerate into which the music is pressed looks cool and inspires imaginations before the stylus on a turntable even has a chance to touch it. Simply said, on first sight, those who gaze upon this LP won’t be able to stop themselves from whispering, “Wow – that’s so cool,” breathlessly. A listener’s initial response to the First Light LP itself has the capacity to be a genuinely remarkable one, but the best part is that the first visual impression informs the music as well as enhancing the experience of it. As the album’s A-side opens and “Gotta Be Cool” sets the tone, listeners will be struck by just how fresh the play really is. Here, singer/guitarist Jed Engine instantly asserts himself as punk’s new, great white hope as he straddles the lines between Joe Strummer (the rasp in his voice recalls the tone of cuts like “I’m So Bored With The U.S.A.” and “Career Opportunities”) and the less-anthemic-but-no-less-captivating nerdcore yelp of Lagwagon with lines like, “Walking past the cats in heat/ Searching for that minor key” and a chord progression which feels like it was cribbed from the same. Listeners who miss the emotionally raw and powerful nature of that music back when it was still fresh and new will find themselves easily drawn into what’s going down here, and will be happy to follow along, even as early as the sound of that opening cut fades out. …And, as it goes, nothing on the A-side of the First Light LP lets the attention that “Gotta Be Cool” won wane. “Drone Control” lets a winsome and compressed lead guitar figure drive a tale of hard luck and love lost before “Bad Vibes” shifts gears into a more Gaslight Anthem tone and tempo, and then “2-4-6-8 Motorway” and “Dotard At The Dial” double team the proceedings with some great, old-fashioned “More cowbell!” rock n’ roll to drive the side home and leave listeners feeling warm and satisfied. True, some detractors could (and likely will) say that much of the A-side of First Light follows a very ‘paint-by-numbers’ paradigm in that it doesn’t seek to expand or push the possibilities of what The Ratchets might be capable of beyond this debut, but it could also easily be argued that what the band is presenting here is a solid foundation upon which to build on future releases and, by the time the side runs out, listeners will find they’re happy to flip the disc in hope of finding that there is indeed more to the story as it’s presented in this start. Those who like the Clash-by-way-of-Gaslight-Anthem start that the A-side of First Light laid out will find themselves well and truly gratified to hear that The Ratchets did not exhaust their supply on the A-side of the album. In fact, the side begins even stronger than its predecessor finished as “World Trade Lungs” dusts off the best ska/rockabilly amalgam committed to tape since the passing of Joe Strummer and makes it live brightly – which is guaranteed to delight listeners. Sure, again, detractors could complain that the “Clash Catbird” seat the band chooses to inhabit could do with a better-defined sense of The Ratchets’ own personality but, as the song plays, it really is difficult to complain about how the song feels because it is just so damned well-polished. The warmth of the guitar tone and the heart in the vocals are just impossible to deny here, and those aspects endure through particular standouts on the side like “Fiscal Spliff” and the stripped down complaint rock anthem “War Office No. 9” too – and they guarantee that, no matter what angle the band seeks to take along the way, listeners will meet them bright-eyed and receptive. Needless to say, the side is a brilliant success and, when the band elects to put it to bed with “Jammyland” – a well-composed and stripped down mid-tempo ballad which seeks to ensure that listeners are left dew-eyed in the end – the sense that band climbed the mountain and won in the end is complete. Listeners will have been well and truly won. First Light is out now. Buy it here on Amazon.